The Echo class is a class of multi-purpose hydrographic survey ships in commission with the Royal Navy. The ships are primarily tasked with conducting survey work in support of submarine and amphibious operations, however, the class also has a secondary role in mine countermeasures. The two vessels of the class are the most recent additions to the Royal Navy's Hydrographic Squadron. Each ship displaces approximately 3,700 tonnes, and is equipped with a state of the art suite of equipment. The Echo class are the first Royal Navy ships to be fitted with azimuth thrusters. Both azimuth thrusters and the bow thruster can be controlled through the integrated navigation system by a joystick providing high manoeuvrability. will they be getting new engines? Scans of ships destroyed in the Battle of Jutland 99 years ago have been made for the first time using 21st Century technology. The colourful three-dimensional images made by Royal Navy survey ship HMS Echo belie the horrors played out off the coast of Denmark one Wednesday afternoon during the First World War. They show the twisted and battered wreck of HMS Invincible, one of 25 warships – 14 of them British – that were blown up on May 31, 1916. Ahead of the battle’s centenary next spring – which will form the focal point of the Royal Navy’s Great War commemorations – survey ship HMS Echo spent a week scouring the floor of the North Sea with her state-of-the-art sonar suite. According to the Guardian, HMS Enterprise is on its way to relieve HMS Bulwark in the Med. A 3700t HSS is relieving a 20000t LPD? Scaling down indeed. How well equipped for humanitarian aid and SAR are the Echo class? Halidon wrote: A 3700t HSS is relieving a 20000t LPD? Scaling down indeed. How well equipped for humanitarian aid and SAR are the Echo class? Contrary to what the linked article claimed, Enterprise will actually be used for intelligence gathering, rather than rescue ops. HMS Enterprise starts hunting for people smugglers in Mediterranean as part of new EU operation. where do Echo and Enterprise have their 30mm guns when they are fitted? marktigger wrote: where do Echo and Enterprise have their 30mm guns when they are fitted? very interesting, waste of a specialist asset though. Its about time fisheries protection was farmed out to a civilian organization, and stop wasting military resources on it. At least shes at sea, but not using the expense specialist equipment she's designed for, wasteful. with all the new MTU diesel generators I wonder will this class finally get new generator sets? HMS Echo has assisted a yacht that became stranded in strong winds just off the UK South Coast. The Plymouth-based Survey Vessel worked together with the Royal National Lifeboat Institution (RNLI) and Solent Coast Guard station to come to the aid of the yacht which had become distressed and unable to make headway in strong winds. The Royal Navy warship was conducting Survey Operations in the Western English Channel when it overheard a distress call from the struggling sailor to Solent Coast Guard. The yacht was unable to get a clear message out, due to being battered by 40 knot squalls whilst attempting to cross Lyme Bay - HMS Echo followed up the call by passing vital information to the Coast Guard, who quickly activated the RNLI. Making way towards the yacht, as her master struggled against the elements, HMS Echo’s crew continued to provide information to the RNLI helping the Inshore Lifeboat launched from Teignmouth to locate the vessel quickly. 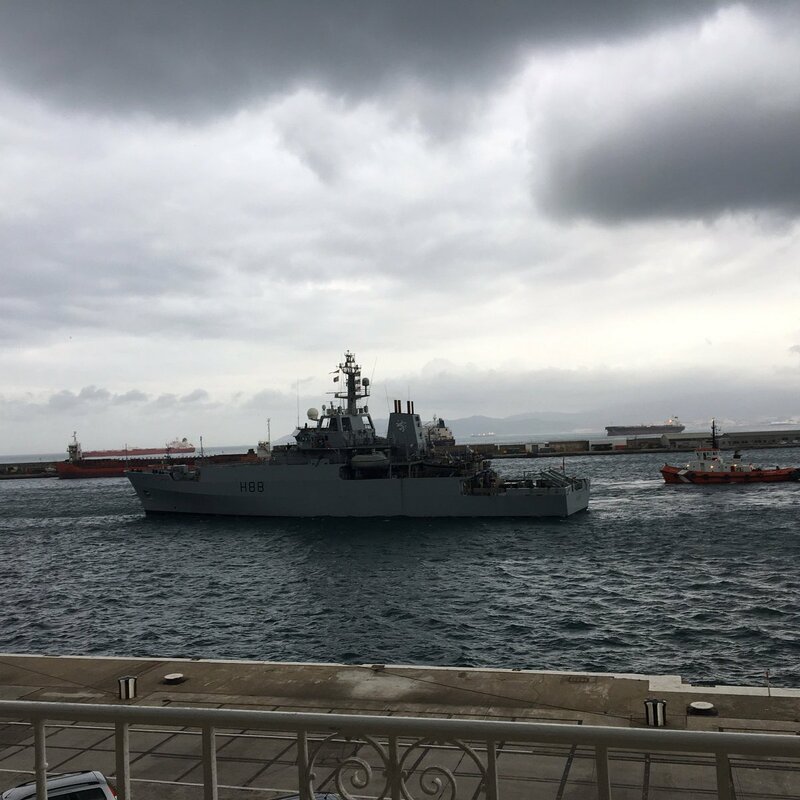 HMS Enterprise in Gibraltar this morning, reportedly heading home after being deployed in the Mediterranean since June 2015. And Echo has now replacing her, guess you'll see her coming you're way soon. RN maintaining a patrol boat in the med, is that a taste of things to come with the new Rivers? I suppose if that's the case assigning one to Gib would make sense. shark bait wrote: And Echo has now replacing her, guess you'll see her coming you're way soon. post Brexit why do we need to maintain Patrol boat, Border Force vessels or Survey ship there?